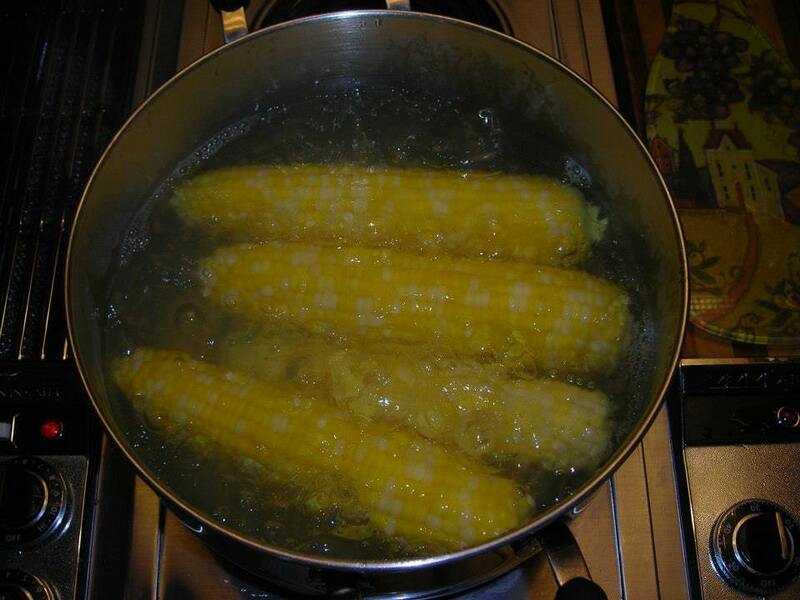 Parboiling fresh corn on the ear. Have you tasted fresh corn-on-the-cob? It is certainly is a Midwestern food and maybe across the USA. In farm country it is the hit of the season with farmer’s markets flourishing along the road sides. Indiana serves the corn cooked in a husk to carry and eat as fun food at county and state fairs. How-to preserve that wonderful taste all winter. Select fresh corn. 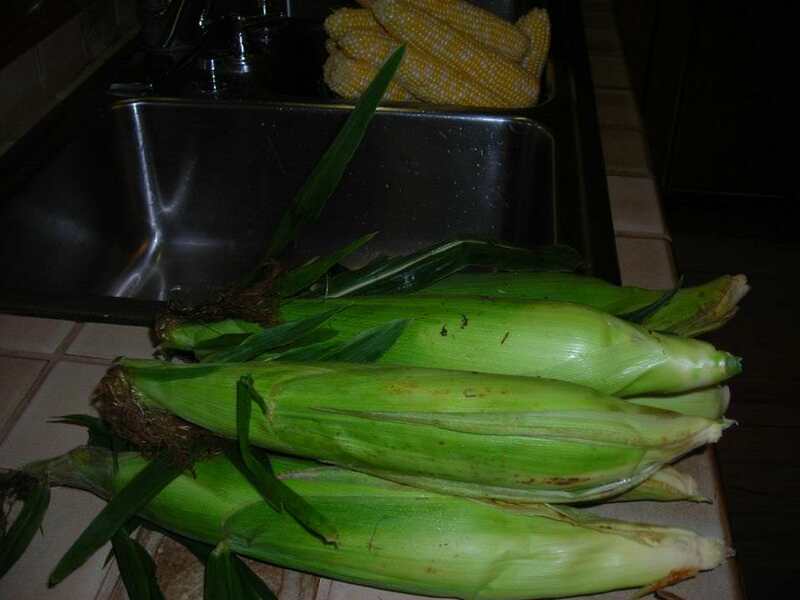 The husks will be removed to prepare the ears of corn for parboiling. The best time to get fresh corn is early in the morning after it has just been picked. Plan on processing it when you get home to maintain the freshness and the milk in the kernel of corn. I prepare 12 ears at a time. Remove the corn husks and the silk. Rinse well. 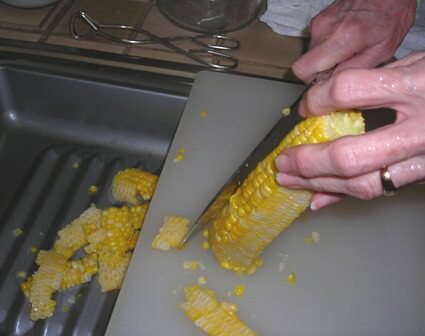 Cutting corn off the cob. Now the corn is ready to be put into a large pan of boiling water. Cover and scald in the boiling water for 4 1/2 minutes. Cool in an ice water bath. 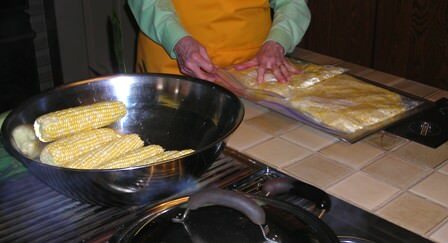 The corn is then ready to cut kernels off the cob and package for freezing. To freeze corn on the cob, after scalding, cooling and draining, put the ears of corn into plastic freezer bags to store in your freezer. 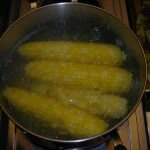 cookbookinabox® has other delicious and great corn recipes. 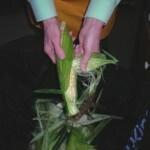 This entry was posted in How-To, Salads, Soups, Vegetables & Side Dishes and tagged corn, corn on the cob, freezing, salads, soups, summer on July 31, 2017 by Julia Ann. A grist mill grinds grain into flour, corn into cornmeal. The corn kernels were ground between two large stones operated by water wheel to turn the stones. The corn is coarser than the corn from grocery store brands. 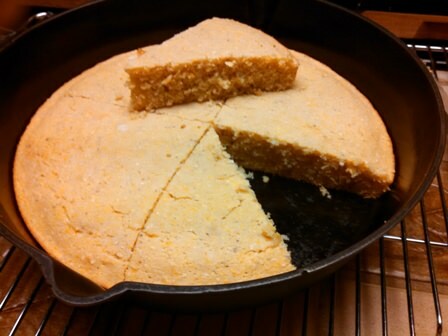 The taste is the same, delicious, and added a new dimension to the phrase of “cooking from scratch.” Stone Ground Cornbread is very good with the Meatless Navy Bean Soup. 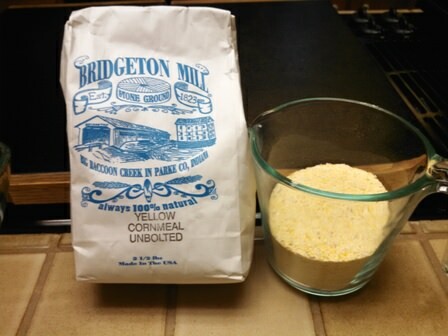 Karen Jean of Bridgeton Mill has a recipe for Cornbread from Scratch on the package which I did use though not completely. I like to bake with honey instead of sugar. I am also learning how to bake/cook with coconut oil. Neither change the consistency nor flavor of the cornbread. Honey and coconut oil were substituted for the brown sugar and cooking oil recommended in the Stone Mill Cornbread. This is a brochure from Bridgeton Mill, it looks just like that. This mill was built in 1823, rebuilt in 1870. Michael and Karen purchased it in 1995, and essentially have rebuilt it to its original use. They even had to restore the dam. They rebuilt the dam to restore the water power. To quote from the brochure, “falling water spins the wheel for power.” You just have to see it to appreciate it. Cornmeals are only a small part of their products. There are grits, some made from purple corn, flours, pancake mixes cornbread mixes and fish batter. There are many USA food products of jelly, jams, honeys, and locally made ice cream. I have only mentioned a very small list of interesting items. Plan a visit to Bridgeton Mill when you are in Indiana. Tell them cookbookinabox® and Julia Ann sent you. Parke County, Indiana has a Covered Bridge Festival, highlighting tours of 31 covered bridges in the area. The second weekend in October and for 10 days, the town of Rockville, Indiana and surrounding area is one big festival of foods, arts, crafts and antiques. Stone Ground Cornbread to enjoy. Stone Ground Cornbread is a delicious home baked cornbread to accompany soups, casseroles and left overs for breakfast feasts. Add the milk, egg, honey and coconut oil. Pour into a hot greased cast iron skillet. (Or pour into a greased 8 x 8 baking pan. Julia Ann and cookbookinabox® in partnership with Netta Belle’s Choice® bring you great recipes for your cooking experience.©2007-2018 Netta Belle’s Choice® The Art of Gourmet Cookery. 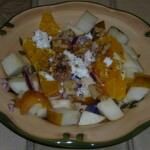 cookbookinabox® “Reg. U.S. Pat. & Trdmk. Off.” Reg. “Trade-marks Canadian Intellectual Property Office. “Netta Belle’s Choice® The Art of Gourmet Cookery® cookbookinabox®.All rights reserved. Julia Ann and cookbookinabox® in partnership with Netta Belle’s Choice® bring you great recipes for your cooking experience. ©2007-2017 Netta Belle’s Choice® The Art of Gourmet Cookery® cookbookinabox® “Reg. U.S. Pat. & Trdmk. Off.”Reg. “Trade-marks Canadian Intellectual Property Office. “ Netta Belle’s Choice® The Art of Gourmet Cookery® cookbookinabox® All rights reserved. This entry was posted in Breads and tagged breads, cornbread, cornmeal, lunch, soups on August 25, 2015 by Julia Ann. Potato and Crab Meat Soup that I make isn’t the real discovery. Though a trip to Charleston, South Carolina was such a discovery of the beautiful, colorful city of many little flower gardens. There was a flower tucked into any place there was dirt, between houses, alleys or an empty spot. It was fascinating to see all the brass door knockers and historical homes. It has been many years since the visit, I hope it is the same. Also enjoyed a hearty bowl of crab meat soup made with the “real stuff” such as Atlantic crabs and cream. The rest of the meal has been forgotten. Soup set me out on a search for a Charleston Cook Book. I came home with TWO HUNDRED YEARS OF CHARLESTON COOKING, 1976. There was a recipe for “She” Crab Soup. 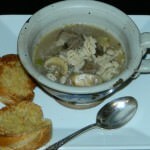 There was no way to duplicate the soup, however that did not stop me from trying an adaption or was it inspiration. 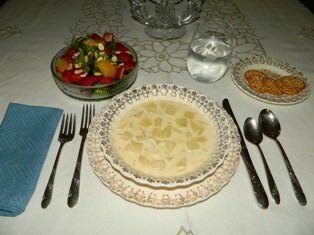 Potato and Crab Meat Soup makes a good beginning for a holiday dinner or for a light, late night supper to celebrate the holiday eve. Cook in a double boiler or heavy large sauce pan to prevent scorching. When using canned crab meat, check for shells; set aside. Peel and dice the potato, cook until soft; drain and set aside. Heat the milk and have ready to add to the mixture. Melt the butter in the double boiler or sauce pan. Add the crab meat and potato and stir in the heated milk. Stir the flour and cream together to a smooth paste and pour into the milk mixture. Add the Worcestershire sauce, Flavour-Enhancer Spice Blend, grated nutmeg and sherry. Cook over low heat for 30 minutes without letting soup come to a boil. 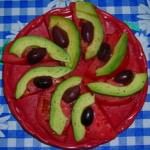 you great recipes for your cooking experience. ©2007-2018 Netta Belle’s Choice® The Art of Gourmet Cookery® cookbookinabox® “Reg. U.S. Pat. & Trdmk. Off.” Reg. “Trade-marks Canadian Intellectual Property Office. “Netta Belle’s Choice® The Art of Gourmet Cookery® cookbookinabox® All rights reserved. 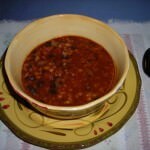 This recipe does not do justice to the original Charleston recipe, though enjoyable as a warming winter soup. 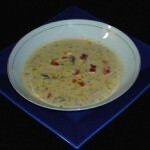 My husband’s family use to have oyster stew on New Year’s Eve. 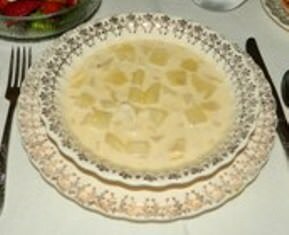 We are not into oysters, so on our New Year’s Eve we have the Potato and Crab Meat Soup, a fruit salad, cake and a glass of white wine. Potato and Crab Meat Soup a holiday evening celebration. Julia Ann and cookbookinabox® in partnership with Netta Belle’s Choice® bring you great recipes for your cooking experience. ©2007-2018 Netta Belle’s Choice®The Art of Gourmet Cookery® cookbookinabox® “Reg. U.S. Pat. & Trdmk. Off.”Reg. “Trade-marks Canadian Intellectual Property Office. “Netta Belle’s Choice®The Art of Gourmet Cookery® cookbookinabox® All rights reserved. 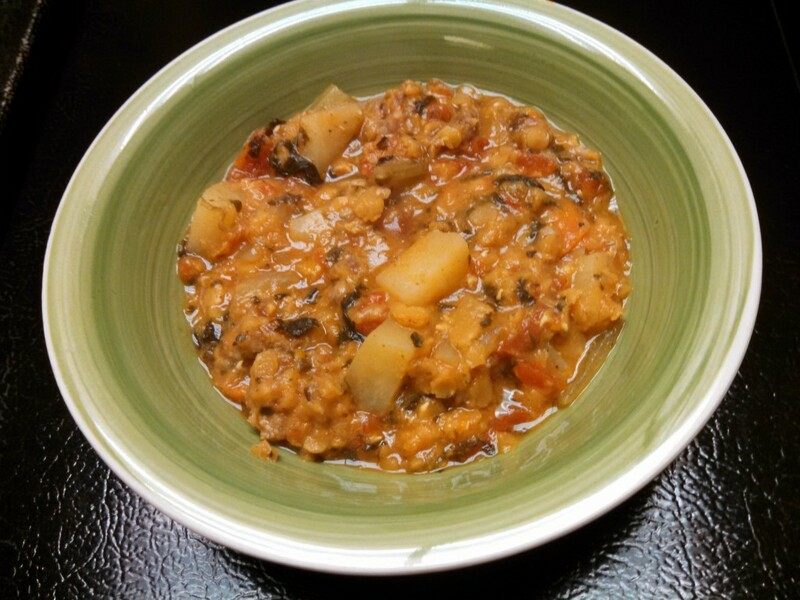 This entry was posted in Soups and tagged crab meat, crab meat soup, potato, potato soup, soups on October 21, 2014 by Julia Ann. Stop and think of the aroma of freshly baked bread. Home-made bread is always a delight and a treat. This loaf of Classic French Bread is easy and not to time-consuming. It is worth the extra effort to have a crusty warm loaf of bread with your favorite hearty soup. Left-overs, if there are any, can be used for bruschetta and bread pudding. Make a big pot of soup using cookbookinabox® recipes for Summer Vegetable Soup and Corn and Mushroom Chowder as hearty soups. A small loaf of French Bread and an easy to do. Put the warm water and yeast into a large bowl or a mixing bowl, let stand for 5 minutes or until the yeast has bubbled on top. Whisk the flour, salt and sugar into a smaller bowl. Add the blended dry ingredients into the yeast mixture. Stir with spoon or beat with mixer using a dough hook until blended. Turn the dough onto a lightly floured bread board or counter and knead about 5 minutes; roll into a ball. Spray a large bowl with the cooking spray. Put the ball of dough into the greased bowl, roll it around to coat the top side. Cover, let rise in a warm place (85 F) free from drafts until doubled in size (45 minutes or hour. into a loaf, round or long. Put it onto a greased baking sheet. Make 2 diagonal cuts across of the top with a sharp knife. Beat the water and egg white together, brush over the top of bread. Bake at 450F for 20 minutes or until the loaf sounds hollow when tapped. To have a warm place: turn the oven on warm and turn it off while bread rises. This can also be made in a food processor. Mix the flour, salt and sugar first in the process, then add the yeast mixture. Process until dough forms a ball, process additional minute. Turn the dough out to knead for 5 minutes. This recipe is from Cooking Light Annual Recipes 1999, p 35......cookbookinabox® in partnership with Netta Belle’s Choice® s, bring you great recipes for your cooking experience. 2007-2018 Netta Belle's Choice cookbookinabox "Reg. U.S. Pat. & Trdmk. Off." All rights reserved. Enjoy your soup and crusty Classic French Bread, Make it often. 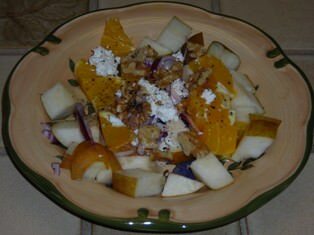 This entry was posted in Breads and tagged bread puddings, bruschetta, French bread, soups on April 14, 2014 by Julia Ann. 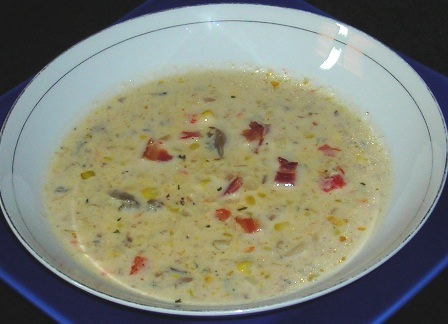 This is a hearty soup for winter or for a summer luncheon, particularly when fresh corn is available from the local Farmer’s Markets. I am an advocate of using fresh vegetables and fruits. That is the advantage of living in small rural areas. However, I have seen Eataly NYC via of the internet. That is on my bucket list. When I can’t get the fresh corn, the next best is the frozen bags I have in my freezer. I never freeze enough; end up using grocery store frozen corn. Just not the same, it does not have the milk scraped off the cob as for cream corn. A Summer Time Treat, fresh corn. Removing husks and silk from the fresh corn. Cut the cooled corn kernels off the cob. 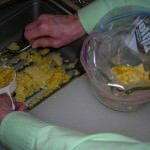 Scraping the cob will get more of the kernel and juices for creamed style corn. 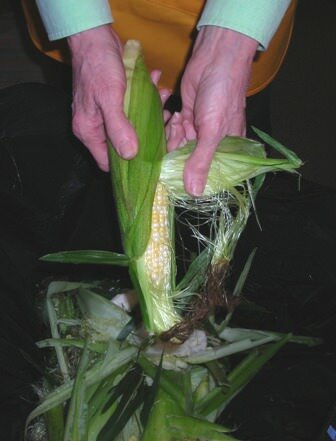 Pack the corn in plastic freezer bags or pint hard plastic container. 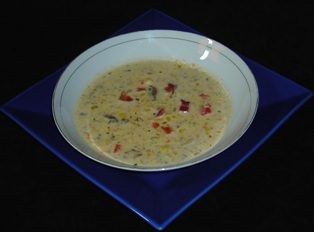 A hearty soup of fresh corn, roasted red peppers and mushrooms, enhanced with crisp bacon pieces. 2 slices bacon, fried crisp and broken into pieces. Prepare the roasted red peppers before starting the chowder. Mince and chop the vegetables to have ready to put into the soup. Melt the butter in a large sauce pan or Dutch oven. Add the onion and garlic, cooking until onion is translucent. Add the roasted red peppers, chopped mushrooms and corn. Pour the chicken broth over the vegetables. Add Blend, sugar and parsley. Stir to blend, cover, bring to a boil and simmer 15 minutes. Add the milk to the soup, cover and cook for additional 5 minutes. 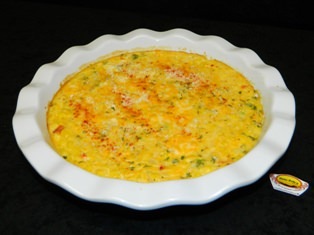 Return the blended egg mixture to the large soup pan and heat only until hot. Fry the bacon pieces until crisp, drain on towelling paper. Serve the bowls of soup sprinkled with crisp bacon pieces. “Reg. U.S. Pat. & Trdmk.Off.” Reg. “Trade-marks Canadian Intellectual Property Office.” nettabelleschoice.com and cookbookinabox.com. All rights reserved. 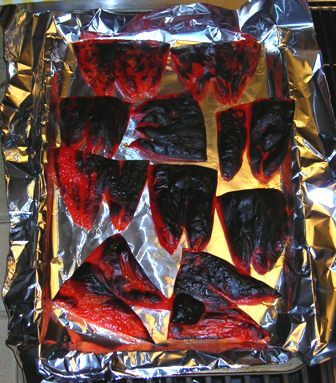 Roasted Red Peppers ready to peel the charred skins. Roasted Red Peppers are a favorite to have on hand in the freezer. I clean and cut them to remove seeds and flatten for broiling about 15 mintues until well charred. Cover them with aluminum foil for another 15 minutes will loosen the skin for easy peeling. Best to wear gloves to prevent staining or burning your fingers. Lay them flat in one layer in freezer bags makes it easier to remove to use in soups, salads, stews, with vegetables, and meats. They are tasty heated with olive oil, oregano flakes and balsamic vinegar for a side dish vegetable. 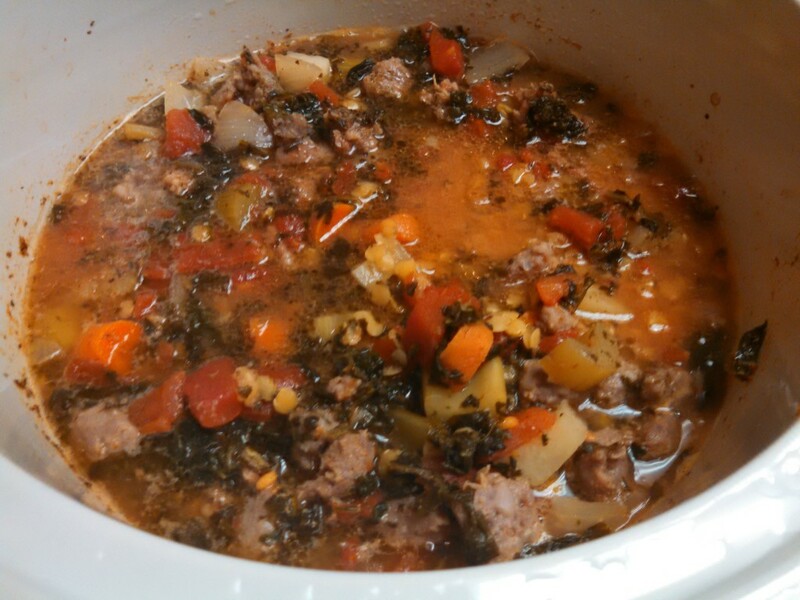 This entry was posted in Soups and tagged bacon, chowder, corn, mushrooms, roasted red peppers, soups on February 5, 2014 by Julia Ann.